PUEBLO, Colo. – There is more than just money and points up for grabs at this weekend’s Pendleton Whisky Velocity Tour event in Fresno, California. Fresno is the first automatic bid being offered to a 2019 Velocity Tour event winner for the Days of ’47 Cowboy Games & Rodeo, presented by Zions Bank, on July 19-23. 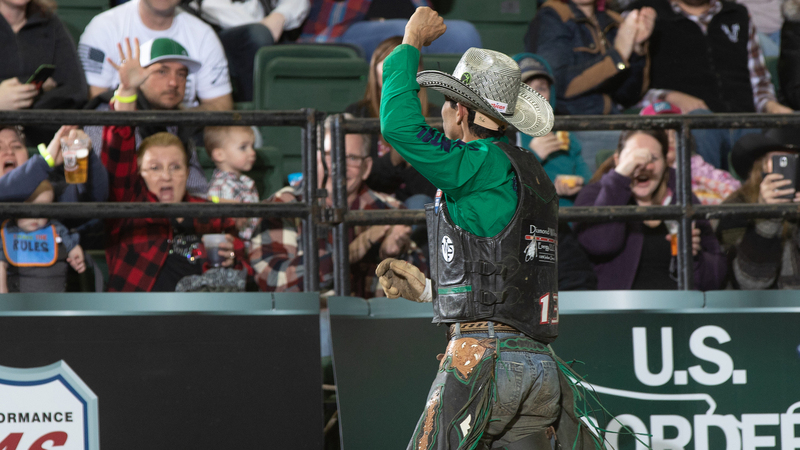 The Days of ’47 is offering five PBR event winners – Fresno; Casper, Wyoming (Velocity); Bakersfield, California (Velocity); Billings, Montana (Unleash The Beast); and Albuquerque, New Mexico (Unleash The Beast) – as well as the Top 3 riders in the world standings as of June 24, 2019, automatic bids to the prestigious summer rodeo in Salt Lake City. Fans can watch the Fresno Invitational is being streamed exclusively on RidePass beginning at 11 p.m. ET on Friday night. With the Unleash The Beast back in session, the Velocity Tour will consistent of riders trying to crack the Top 35 of the world standings and ultimately make a push for the 2019 PBR World Finals. Here are five riders to keep an eye on in Fresno. Nobbs is the highest-ranked Australian in the world standings that is currently competing in North America. No. 13 Aaron Kleier, No. 28 Cody Heffernan, No. 33 Cliff Richardson, No. 41 Lachlan Richardson and No. 43 Jason Mara are all currently in their native country competing at PBR Australia events. The 21-year-old has gotten off to quite the start in the United States this year by riding eight of his first 10 bulls. Nobbs has won two events – the Texarkana, Arkansas, Touring Pro Division event and the three-day Bangor, Maine, Velocity Tour event. This season is Nobbs’ first on the Velocity Tour. He had previously bucked off 17 consecutive bulls on the Touring Pro Division level until riding his two bulls in Arkansas last month. Nobbs is 15-for-47 (31.91 percent) in his PBR Australia career. Twelve of the Top 15 riders on the Velocity Tour have been able to convert their success on the PBR’s development tour into a spot on the Unleash The Beast. Therefore, the race to win the 2019 Velocity Tour championship continues to feature more and more contenders on a weekly basis as the top Velocity riders graduate to the UTB. Lino is the highest-ranked Velocity Tour rider competing in Fresno at No. 13. If he were to sweep the event and earn 270 world points this weekend, he would take over the Velocity Tour standings lead and join the other Velocity title contenders on the UTB. Lino is 6-for-19 (31.6 percent) in 12 Velocity Tour events. The 2018 PBR World Finals event winner got a little bit closer to getting back onto the Unleash The Beast last weekend by winning Round 1 in Wheeling, West Virginia, with 87.5 points on One Boot. Eguchi was able to earn 55 world points in Wheeling despite bucking off his final two bulls and creep to within 80.83 points of No. 35 riders Stetson Lawrence and Sean Willingham. This weekend is Livingston’s second 2019 Velocity Tour event, his first since being cut from the Unleash The Beast three weeks ago. Livingston finally got himself entered at a Velocity Tour event and the talented 20-year-old could quickly take the VT by storm. The two-time PBR World Finals qualifier double-entered last weekend at the Belton, Texas, Touring Pro Division event and was 2-for-6 for 15 world points. Livingston is 85 points behind the Top 35 of the world standings. The Burleson, Texas, native is 13-for-35 (37.14 percent) in his career at the Velocity level, but 30 of those outs came in 2017 when Livingston was battling through a shoulder injury all year. The five-time Wrangler National Finals qualifier is always a threat to win an event, especially based on his 53.88 percent riding average in seven Velocity Tour events. In fact, Frost is the only Velocity rider to have competed in seven or more Velocity events and have a riding percentage over 50 percent that is not inside the Top 35 of the PBR world standings. Frost went 1-for-2 last weekend in Dayton, Ohio. Don’t forget to watch “PBR Ride to Glory” every Tuesday at 9 p.m. ET on RideTV to see more footage of the PBR’s Pendleton Whisky Velocity Tour.